Experience the island chain that has enchanted explorers since Darwin first dropped anchor off its shores. Spend a week exploring the incredible wildlife of the Galapagos archipelago aboard a stylish vessel - the Yolita II. This tour takes you to some of the lesser-visited islands like Genovesa in the North and Isabela in the West. Expect to witness an amazing concentration of birdlife and massive bird rookeries, including the largest nesting colonies of red-footed boobies and frigatebirds. Please note that this tour is operated in conjunction with a local specialist company and is not exclusive to Explore customers. Your fellow passengers may come from a number of different countries although all guiding is done in English, and may include families. 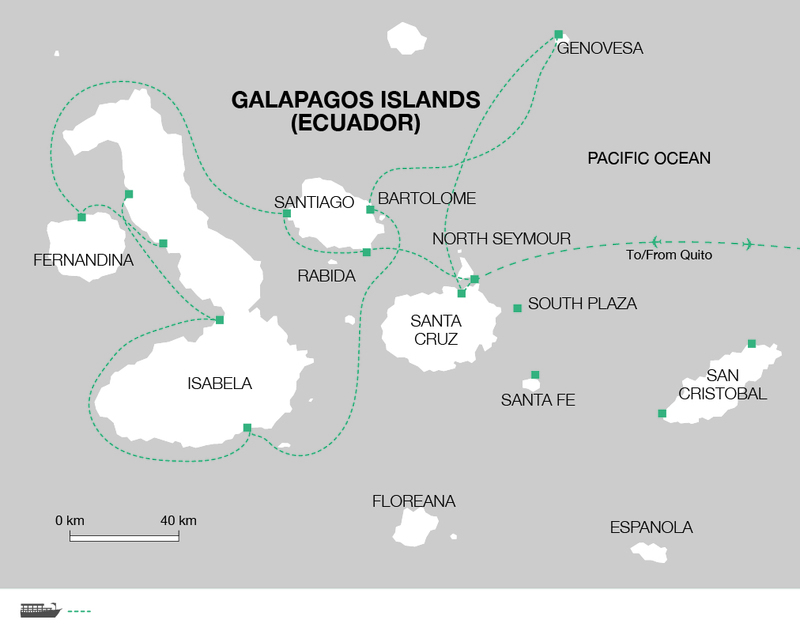 Today we transfer to the airport early for our flight to the Galapagos Islands. On arrival into Puerto Ayora, we will meet our naturalist guide and transfer to our ship - the glorious Yolita II. Once on board, we will head to Bachas Beach to see Sally Lightfoot crabs, flamingos and sea lions. Take a morning excursion to the red sand beaches of Rábida to see a lagoon and the famous bachelor sea lion colony. This area is known for it's abundance of wildlife, including pelicans, white -cheeked pintails and boobies. In the afternoon, we will visit Playa Espumilla, one of the most idyllic beaches in the Galápagos Islands and home to thick mangroves and flamingo and sea turtle nesting sites. Today, we explore the tiny conical island of Daphne, home to nesting blue-footed boobies, frigatebirds, Darwin's finches and other wonderful wildlife, before flying back to Quito. On arrival back on the mainland, we transfer to the hotel for our final night in Ecuador. Our tour ends in the morning, after breakfast. The Yolita II is a stylish 16 passenger ship which has recently been refurbished. Boasting spacious cabins with plenty of outside deck space. The large upper deck allows you to soak up as much of the Ecuadorian sun as you need. All cabins have side by side berths, private bathrooms and air conditioning. All meals are provided and are served aboard the vessel. There is an outdoor and indoor dining area. Snorkelling equipment, wetsuits and beach towels are included at no extra charge. On this tour, the price is based on a standard cabin. USA: An electronic travel authorisation (ESTA) is required by British citizens transiting via the USA. This must be done on line (https://esta.cbp.dhs.gov) no later than 72 hours prior to travel. You must also have an electronic passport with a digital chip. The UK electronic passports feature a small gold symbol (camera) at the bottom of the front cover. Please note that if you have visited Iraq, Syria, Iran or Sudan in the past five years you cannot travel with an ESTA and instead you will need to apply for a visa from the nearest US Embassy or Consulate.